If you come to our Chattanooga office to get your teeth cleaned then you have had a chance to meet our most experienced hygienist Kristin. Kristin is fun and talkative to say the least. Friendly is a word to describe Kristin she is always smiling and admits that she loves to talk. Honestly she just loves people and loves conversing with them, to find out about their lives and learn from them. She is a very kind person and would do anything to help someone in need. She is fun to be around and can make the mood fun in a room with her contagious laughter. Kristin has been with us for 3 years now and is our only part time employee. She has been a dental hygienist for 13 years and before that she was a dental assistant for 5 years. 18 years of experience in the dental field. To say she knows her way around a dental office is an understatement. 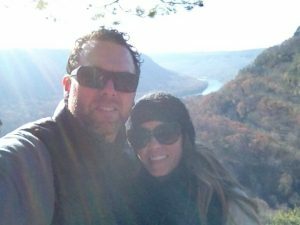 Kristin moved here from Utah when her husband transferred to Chattanooga with his job. In Utah she worked for a dentist who went to University of Louisville with Dr. Mark and Dr. Ellen McOmie. She also worked for an office which is owned by one of Dr. Mark’s best friends from high school. What a small world! 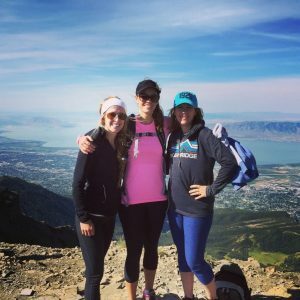 Kristin and her friends on top of Mount Timpanogas, Utah, 11,752 feet above sea level! 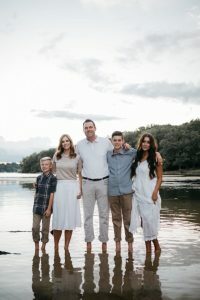 Kristin was born and raised in Utah, she is from Ferron, Utah. She went to High School with NBA star Sean Bradley who is 7’6″ tall. She played basketball with Sean Bradley’s sisters, although they are taller then Kristin she says she could still dunk on them. In high School she played Basketball, Volleyball and ran track. She comes from a large family with 6 kids. She has 5 brothers! This made her tough and she admits bossy, telling her brothers what to do all the time. After she graduated from high school she went to Utah Valley University where she graduated with her hygiene degree. She met her husband Jason in Provo, Utah. 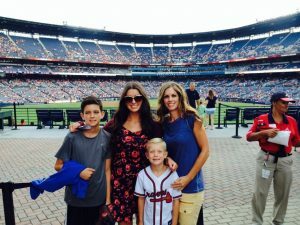 Kristin and her kids at a Braves game this summer. She has a dental implant. She has no problem with people hunting. She says she would rather die then go hunting, she thinks it would be awful. A self proclaimed clean freak! She has webbed toes. She can swim very fast. Once at dinner with Karl Malone and John Stockton. Her daughter is a sophomore in college at BYU. Met her husband on a blind date. She was pleasantly surprised that he wasn’t ugly. Running is one of her loves although she says she is getting older and can’t do it as much without injuries. She loves exercise in general. Yoga, hiking, walking are a few of the activities she does routinely. Has an amazing baked bean recipe, it is incredible. 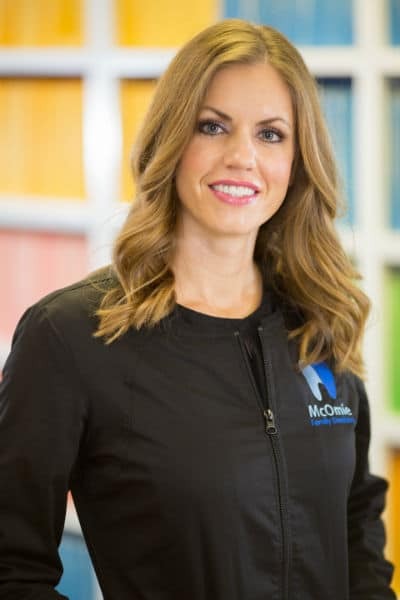 Before she worked at McOmie Family Dentistry she brought her kids in first then she and her husband came in as patients. A short time later we had a position open and she was hired. She has 1 daughter and 2 sons. Is still mad they fired Phil Fullmer for no good reason. Has never had short hair. She is a perfectionist. This works out well for dentistry as it is very detailed oriented. Ran a marathon in Silicon Valley, CA with her littlest brother. 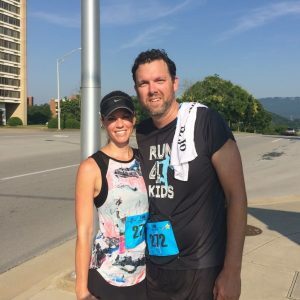 Kristin and her husband after the Riverbend 5k. You are not from Tennessee. What do you like about Tennessee now that you have been here 4 years? I think Tennesee is beautiful! It is so lush and green here, and I LOVE humidity. Is that weird? I also think Chattanooga downtown area is awesome. I love all the outdoor things this area of the south has to offer it is wonderful. The people of Tennessee are awesome! One of the things we first noticed after moving here is how polite and kind people are in general. 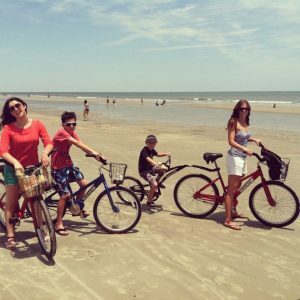 We learned quickly that southern hospitality is a a real thing! What do you like about dentistry? I like interacting with people and having the opportunity to teach them something that can improve their lives. I really like seeing the improvements in dental health of my patients. Knowing it is tied to their overall health. This may sound weird but, I love removing tartar it is fun! I love that our office is up on the newest and latest in materials and techniques! It is great going to work each day knowing we are doing top quality work! I think our patients are exceptionally friendly, they are very nice. Patients have become friends. One other thing that makes life good is that I truly love my co-workers! Each one is an expert at what they do and they are like family to me.